The Insulated Wide 12oz is the best stainless steel coffee mug solution for hot coffee, hot tea or your favorite iced drinks. Leak proof Café Cap 2.0 is easy to drink from, clean and keeps liquids contained. Climate Lock™ double-wall vacuum insulation keeps drinks hot for 8 hours and iced for 24 hours! Klean Coat™ powder coat finish is 4X more durable, chip-resistant and safe for people and planet. .
- 18/8 Stainless Steel construction. - Climate Lock™ double-wall vacuum insulation will keep drinks hot for 8 hours and iced for 24 hours. - Klean Coat™ powder coat finish is 4X more durable than our previous finish and formulated for human and environmental health (Brushed Stainless has no coating). - Electropolished interior, a safe & non-toxic process, and rounded corners make it easy to clean. - Includes the leak proof Café Cap 2.0. - Compatible with all Wide Caps, including Wide Loop Cap. - Hand washing is recommended for all Insulated products. 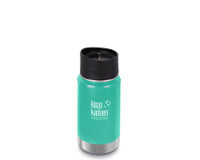 Kool Depot is Kean Kanteen's international dealer & *featured online partner in Singapore.